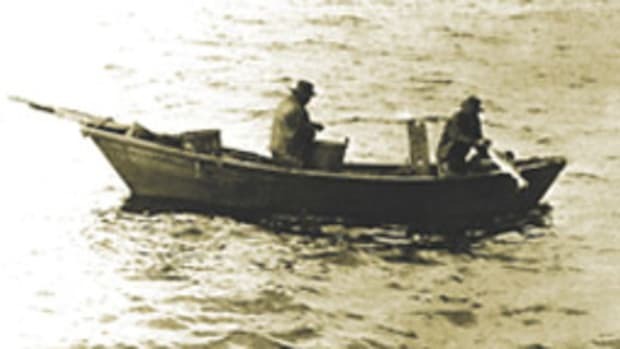 Hinckley Yachts saw an opportunity and arranged to buy and transport hull No. 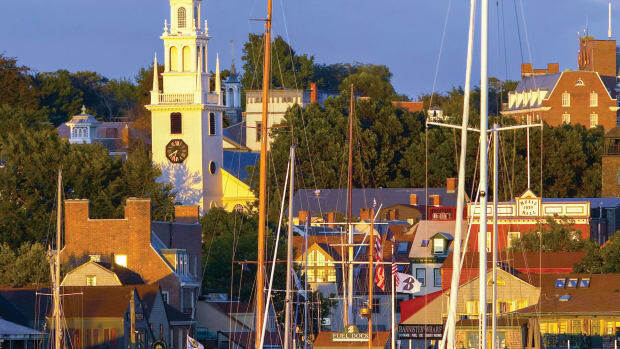 62 to Hinckley Yacht Services in Portsmouth, Rhode Island. 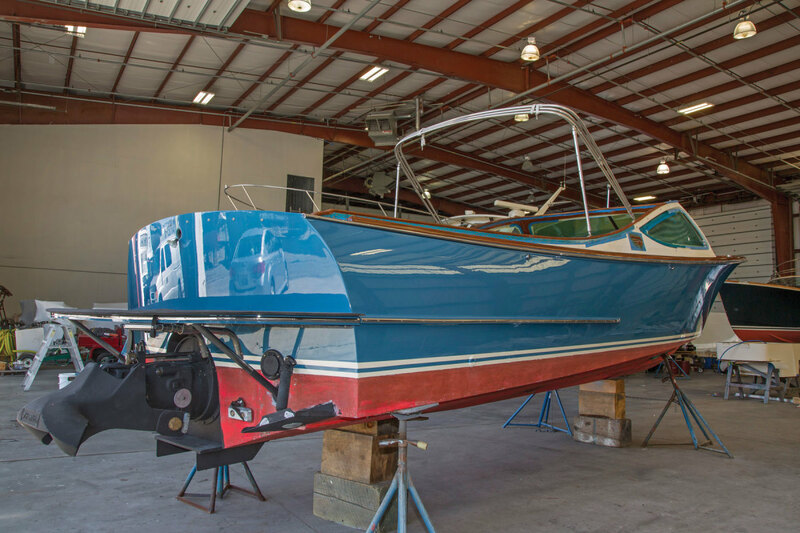 Rescuing her made sense: The company didn’t have a client, but the completed restoration would create a portable showcase for HYS’s refit capabilities. 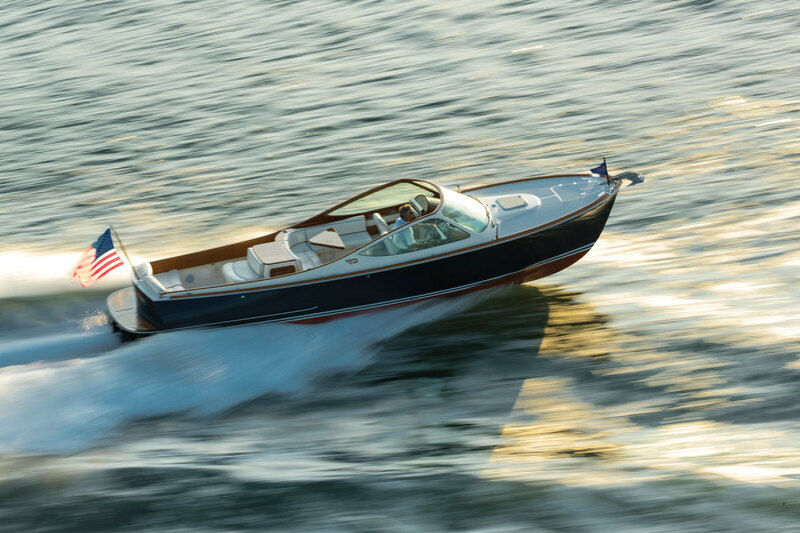 Service has become the lifeblood of Hinckley and other builders that focus on high-end boats sold in relatively modest numbers. This concept helped Lexus get a foothold in a marketplace dominated by Mercedes-Benz and BMW. Unlike automakers, which concentrate on regular service and customer care, HYS encompasses everything from routine service and storage to complete refits. All boats are welcome — big and small, old, barely used. The company has service facilities along the entire Eastern Seaboard and recently opened its latest in Stamford, Connecticut. 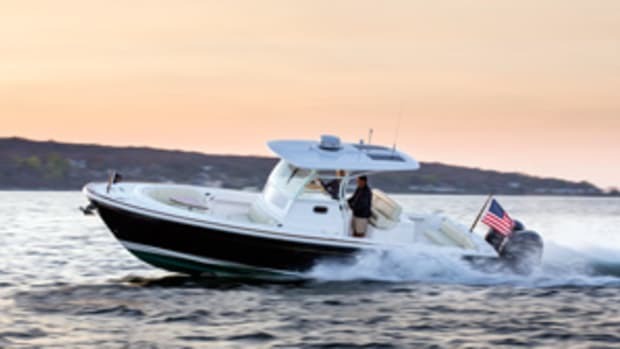 Going over the top in service helps maintain the high resale value of Hinckley’s models. 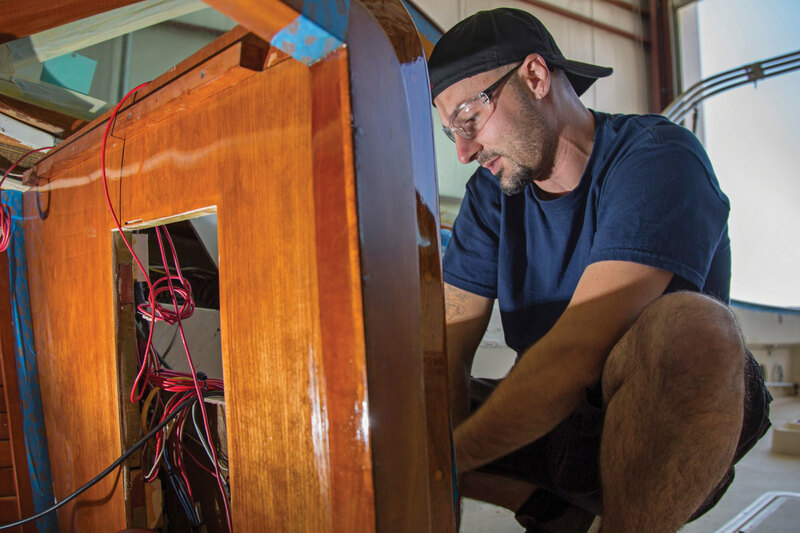 The yard in Portsmouth can do most anything — carpentry, high-tech composite repairs, painting, mechanical and electrical upgrades, plumbing and upholstery. 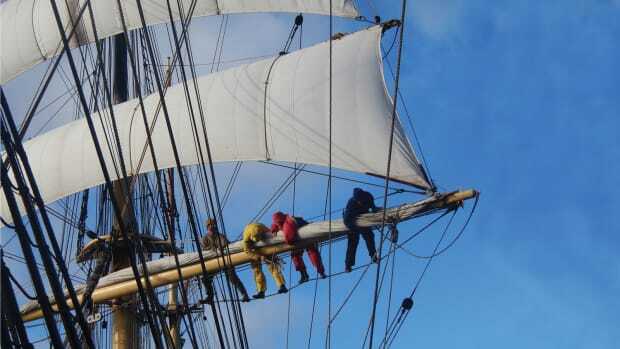 (It hasn’t tackled sails and spars, though.) 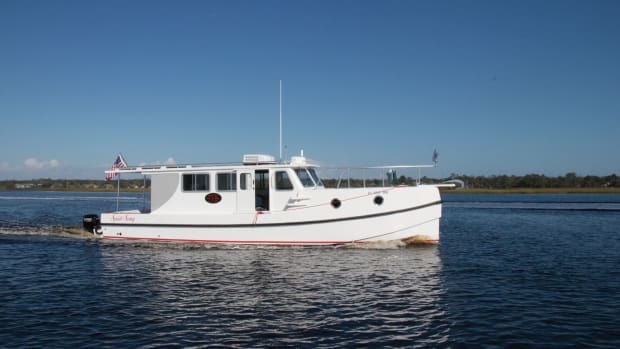 The T29R (now known as the Runabout 29) placed in HYS’s care was built late in 2003 at the company’s facility at Trenton, Maine, and delivered to her owner in 2004. The hull is a Dual Guard composite laminate, which consists of a Kevlar and E-glass outer skin and a carbon fiber inner skin, with balsa and Core-Cell coring, infused with vinylester resin using the SCRIMP method. The deck and cockpit are E-glass over balsa and Core-Cell and infused with vinylester resin using SCRIMP. 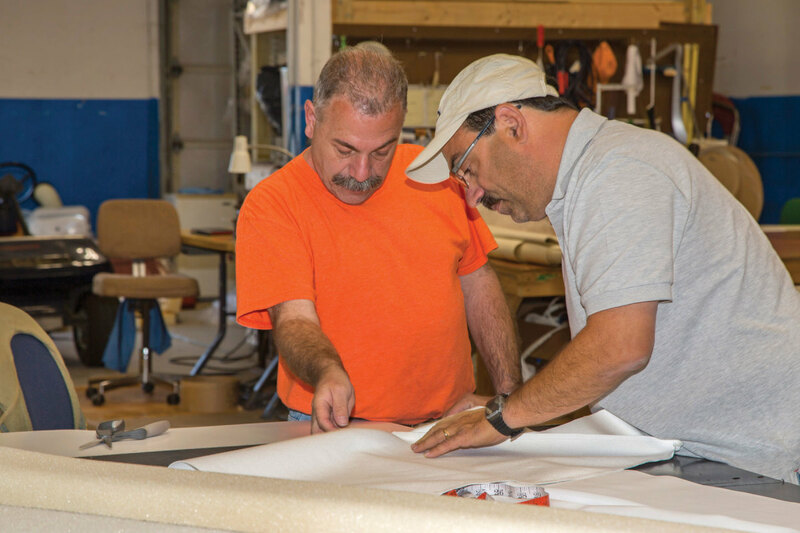 Upholstery shop manager Oscar DeLemos (right) confers with a craftsman. The upholstery shop creates canvas, cushions, curtains and headliners. The first order of business: replace the original Yanmar 440 with a 2017 electronically controlled version of this engine. “No smoke,” says Tim Shields, general manager of Hinckley Yacht Services. The new engine also burns less fuel. Along with the engine, HYS installed a new ZF electric-shift transmission and the latest version of Hinckley’s Jetstick control. No good having a new engine and transmission spinning a tired Hamilton jetdrive, so the mechanics overhauled the existing unit. They removed the tailpipe and bucket, replaced internal and external anodes and hull zincs, checked the oil in the hydraulic control and changed the filter, bled and adjusted the hydraulic pump, lubricated the bearing and shaft, inspected the jet’s wear ring and impeller, and took care of a few other items. The hydraulic bow thruster received a thorough cleaning, a new zinc and a check for leaks in the oil reservoir. A nicely rehabbed cockpit seat replaced the tired, sun-worn original. Aside from the upgrades to the running gear, the most exciting part of the refit is the installation of Garmin’s GPSMAP 7612 12-inch glass helm and Mastervolt’s CZone digital control and monitoring network, which bundles lighting, power monitoring, tank monitoring and other functions to simplify operation of the boat. A mode bar displaying these configurations allows quick access and can be displayed at the top or bottom of the plotter display. A new Garmin autopilot completes the control package. An electrician at work on wiring behind the new console. 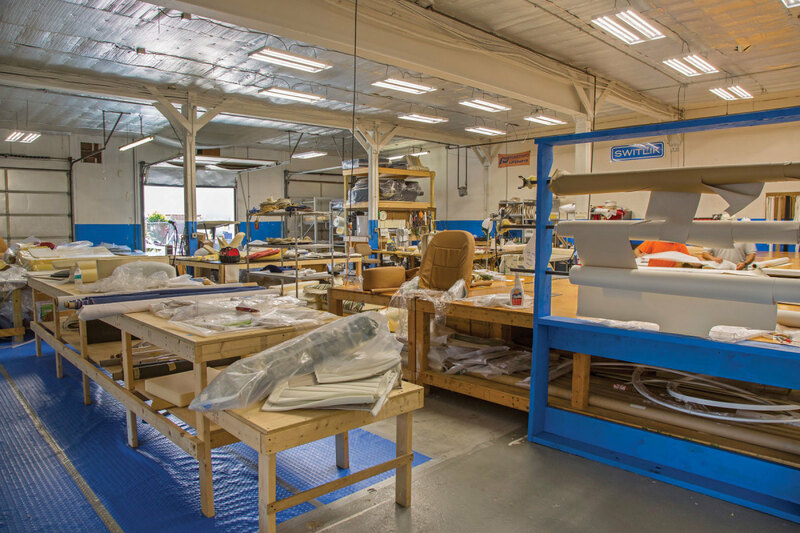 The soft goods had suffered mightily from the sun and humidity, but HYS’s upholstery shop, located in a separate building, has everything under control. Piles of foam and roll upon roll of fabric and vinyl fill the shelves around the perimeter of the space. Staffed by a handful of craftsmen, the shop cuts and sews all the canvas — soft top, side curtains, backdrop, windshield curtain and mooring cover. 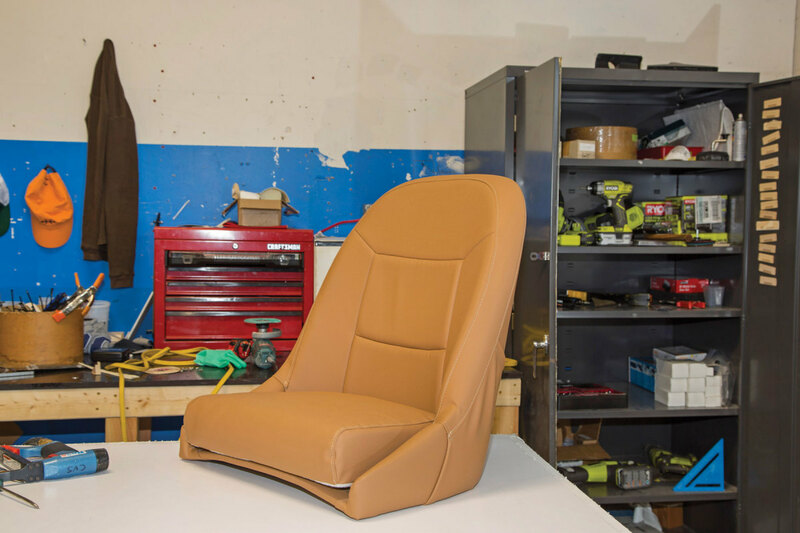 Using original patterns, the team fabricated a complete set of foam cushions for the boat, then sewed and fitted new vinyl seat covers. They also replaced all four headliners. It’s the quietest shop in the Hinckley complex. A lot of the brightwork suffered water damage and burn-through. The underlying structure was sound, so installing new veneer will return the joinery to its former glory. Water had damaged the port-side main bulkhead, which showed a previous repair done with mahogany veneer instead of cherry. After the team locates and repairs the source of the leak, it will apply new cherry veneer. Among the other areas damaged by water were the cherry battens lining the hull inside the cabin and the lower section of the starboard-side helm pod. Details, details, details. Hinges on the lid of the engine box were loose and pulling free. All doors and drawers needed adjusting, and many require new latches. A damaged companionway lock needed replacing. The toilet-paper dispenser was missing. Brackets holding the deck hatch pistons were loose, and the list goes on. Badly weathered or otherwise dented teak accents will be replaced or refinished, too. Much of the exterior woodwork showed crazing, burn-through or both, so the team stripped the components to bare wood, then sealed and finished them with 10 coats of Epifanes varnish. As work progressed, the carpenters and finishers found a window of time to complete their work before the paint shop refinished the hull. This sequence may be unusual, but it didn’t cause problems. In addition, the timing kept work flowing smoothly. The hull was refinished in Awlgrip Petrol Blue, and the bottom will get black antifouling paint. The Hamilton Jet Drive was overhauled and is powered by a new Yanmar. Refinishing a fiberglass hull requires a lot of preparation and plenty of skill from the painter. The goal of preparation is to eliminate imperfections that will show through the paint. This requires hours of fairing and sanding before applying the primer. HYS finished the hull with Awlgrip Petrol Blue, accented with a double boot stripe of Cream. The topsides of this boat are as nicely finished as any I’ve seen. After heavy machine sanding, the bottom received black antifouling paint. Sound attenuation has improved since this boat was built, so HYS replaced all of the original insulation with the newest product. Additional work in the engine room included cleaning, degreasing and painting the engine pan. Before HYS launches the “new” boat, the crew will inspect all of the work to make sure that every screw, stitch, bead of caulking, varnished surface, electronic component and piece of running gear are perfect. Better than new? Probably not, but it’s close enough to make no odds. 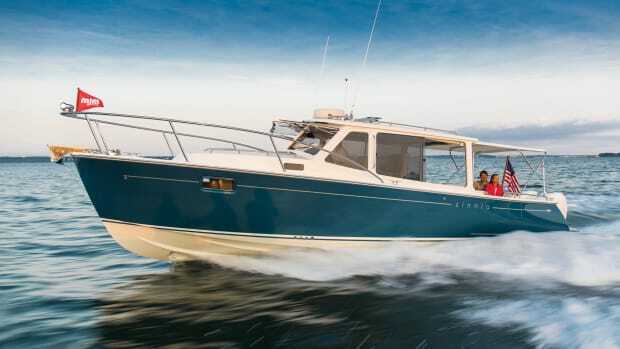 Lightweight, agile, fast, seakindly, economical and quiet — you’ll find these qualities and more in the MJM Yachts 35z. I met her at Newport Shipyard in Rhode Island this past July. “You can choose your friends, but you can’t choose your family,” the cynics say. 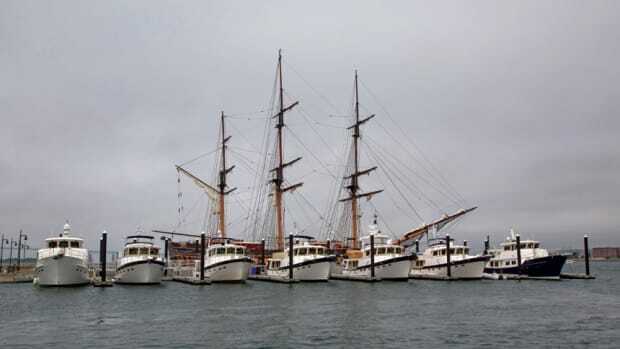 But the 185 Kadey-Krogen owners who attended the company’s 40th anniversary rendezvous at Fort Adams State Park in Newport, Rhode Island, beg to differ. A circumnavigation is the stuff of dreams, the ultimate sailing challenge. Few pull it off.